Three additional bridgeheads across the River Moselle were gained by the infantry of General Patton's Third United States Army yesterday. The Americans now have five bridgeheads on the Metz-Toul sector. Opposition continues heavy, but more armour is reported over the river. British infantry and armour are across the Albert Canal in strength, said Bill Downs, C.B.S. correspondent from Brussels. Bitter fighting is under way as the Germans strive hard to keep the bridgehead from expanding. "The Germans seem to have been able to organize themselves into strong defense units along the north bank of the canal for the first time since the British entered Belgium. They are contesting every crossroad and hill." Writing last night, E. E. Sandford, Press Association correspondent at Shaef, said: "As the war moves swiftly to the climax, the Allied Higher Command has ordered silence on the armies' moves into position for the last battle—the Battle of Germany. In the next few days little news will be obtainable about the Allied Armies now everywhere closing in upon the Siegfried Line from Holland to Switzerland." As the British drive over the Albert Canal and the Americans edge towards Germany at a score of points from the outskirts of Liège to Nancy and the Rhine-Marne Canal, Gen. Patch's Seventh Army hastens up from the South of France to add even more overwhelming power to the death-blow against Hitler's Reich. The official silence will not apply to operations in the Pas-de-Calais, where the Germans in and around Dunkirk are now in an area roughly the same as the forward perimeter held by the B.E.F. in 1940 while the little ships were taking troops off the beaches. The Canadians' line runs inland from Gravelines and then parallel to the coast as far as the Nieuport Canal. Boulogne and Calais are both now completely surrounded. Le Havre was again bombed yesterday by Lancasters of Bomber Command. Spitfires patrolled up and down the coast to Zeebrugge watching as keenly as the Nazis in the Channel ports for the rescue ships that do not come. A German military spokesman stated yesterday: "The large-scale withdrawals which the German Command was forced to carry out can now be regarded as more or less concluded. "Leaving strong garrisons in several stiffly-defended fortresses in Brittany and the Pas-de-Calais, and strong resistance nests between the spearheads of the Allied advances, the German divisions have now manned a line which runs along the Scheldt, the Albert Canal, and the upper reaches of the Moselle. From here it runs in a wide arc jutting to the west, right to the Swiss frontier, north of Lake Geneva." Eric Downton, Reuters special correspondent with the Third United States Army, telegraphed last night: "Armoured units of Gen. Patton's Army are now established on the east bank of the Moselle. "During the night the Germans put in fierce attacks against the two bridgeheads over the river, but these were held, and this morning more Third Army men crossed over. "Gen. Patton is bringing up new forces for an assault against the German defence line. "German pockets of resistance west of the Moselle are being mopped up and operations are reported to be progressing well. "The Luftwaffe staged a comeback during the night, bombarding troop concentrations both sides of the river. "The crossings of the Moselle were achieved in the teeth of bitter resistance by nearly perfect ground and air co-operation between the Third Army and the 19th Tactical Air Command. "German troops in this sector have been ordered to hold firm or be shot if they attempt to retreat, according to prisoners brought in today. "The Germans are certainly putting up a strong fight on the advanced sector east of the Moselle. Their artillery, including 88's, are shelling our infantry and tanks." Charles Lynch, Reuters special correspondent with the Canadian forces before Dunkirk, telegraphed last night: "The second ordeal of Dunkirk has begun—this time with the Germans' back against the North Sea coast and writhing under Allied machine-gun and artillery fire. "From the flooded farmlands just south of Dunkirk we cannot see the city, although it is only six miles distant. But all around us our guns are shelling the Germans, who are being pinned in the port as their comrades are pinned in Calais, Boulogne, Le Havre, and Brest. "The road on which I am standing is the only dry spot for miles around. Five months ago the Germans opened the dykes and let the water pour over these fertile farmlands as an anti-invasion measure. "Whereas in Le Havre, Boulogne, and Calais the chief stand is being made by the Regular garrisons, most of the troops in Dunkirk are those who tried to escape south-east to Germany, but found their way cut off and so fell back. "Their position is strikingly similar to that of the British troops who fell back on Dunkirk in 1940—but what befalls them will be entirely different." Bill Downs, C.B.S. correspondent, in his broadcast already quoted, said: "The 15th German Army troops now trapped in the Channel pocket seem finally to have realized their predicament. They are making desperate attempts to get across the wide Scheldt estuary and to make their way back north through Holland and Germany. "The Allied Air Forces have spotted this movement and have the Nazi barges and boats operating in the river under attack." 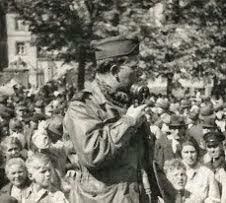 Roger Greene, Associated Press correspondent in Brussels, telegraphs: "While Gen. Dempsey's army poured across the Albert Canal, blazing the trail for the next phase of the whirlwind campaign, broken remnants of the German armies were falling back into the Channel ports and trying to escape into Holland. All avenues of retreat to the east and south-east have been cut off. "Sizable German pockets are resisting in the area north-east of captured Ghent and Le Havre suicide garrison is still refusing to surrender under combined land and air assault. "The German News Agency reported yesterday that British armoured columns had succeeded in forming a bridgehead across the Scheldt, near Antwerp, under cover of motorized guns massed in strength in the area. It was claimed, however, that a counter-attack had thrown the Allies back beyond their initial positions and the bridgehead was somewhat compressed." Allied gunfire is audible in the western counties of Basle as Allied troops advance upon Belfort and the gap between the Vosges and Jura Mountains leading to the Southern Rhine Valley. A message from Switzerland gave news last night as American troops of Gen. Patch's Seventh Army pressed forward on the last 40 miles in their race for the gap. Stubborn resistance in the area of Besançon, where American patrols reaching the western, southern, and eastern outskirts of this key town, southwest of Belfort, encountered tanks and sharp mortar and machine-gun fire, was reported from Allied Mediterranean Headquarters. A C.B.S. dispatch "from the Belfort Gap," quoted by New York Radio last night, stated that the Germans were in full retreat through the gap and doing their utmost to get out from that area — Reuters and A.P.